Natural grooming products made from the finest ingredients. A complete shaving routine that will result in smoother, healthier skin. 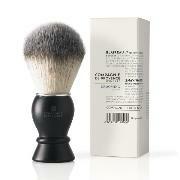 An easy to apply shave cream that softens the hairs, makes it easier to cut and allows a really close shave. Always make sure your blade is really razor sharp! Apply the shaving cream on warm and wet skin and shave in your hairs growth direction. Organic shea butter protects, moisturizes and has a calming, healing effect. Organic essential oil mix from laurel leafs has cleansing, bacteriostatic and calming properties.